Time for my second video of my first play through of the new game, Uncharted 4: A Thief’s End. If you remember my last post and video, I had started the very beginning of the single player mode and posted a video and describing what has happened in it. You can check it out here if you haven’t already. The video ended with a younger Nathan Drake (older than the kid part earlier on) at a prison, but also looking for something specific in a much older part of the prison regarding a pirate from a very long time ago. I had just started to make my way there when I ended the first video. In this one, I pick up where I left off. I’m trying to make my way to that abandoned section of the prison and I had come across a large crate that I was able to move around. Now I originally thought that I had to move it to where it would drop in a well or off the side of a cliff to break it open to get what was inside of it. This was not actually the case at all. I had to move it to a certain part where I would then climb onto the top of it so that I could jump to reach a certain ledge and continue forward or moving closer to the old prison tower. I had to do a lot of jumps and climbing that also required the use of a grappling hook and rope that I found back near the crate. It was pretty easy to get around especially once you know the controls to do so. I finally make it to the old section and find my way in. One of the first things that I notice once I get in there through an open window is that there are a lot of markings all over the walls and ceiling and protruding stones in the walls that have Roman numerals on them. I knew exactly what it meant as it is the first puzzle in the game that you encounter. As you search around the room, there is a note that you do find where you it appears to be the hand writing of the pirate. It talks about what he was there for and also if you fold that note, you’ll notice a couple of the symbols match the ones on the walls. This should help you to find which one of the stones with the Roman numerals you need to pull. Now I’m not always the best at solving puzzles in games especially when it should generally be easy ones. 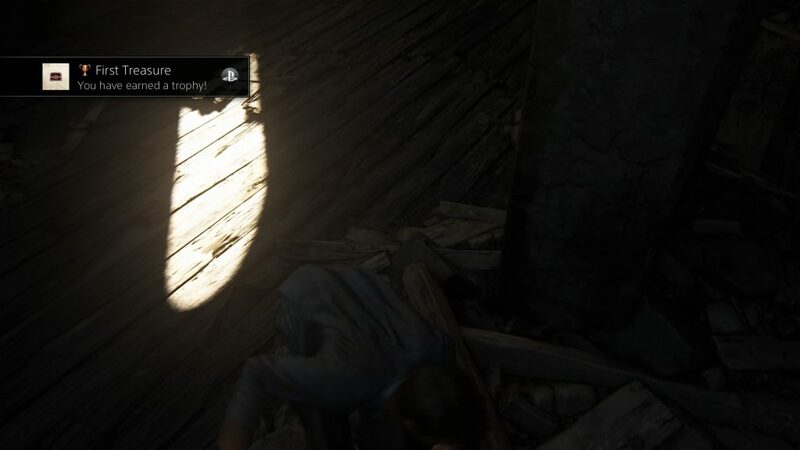 The game will automatically give you hints after a certain time if you’re having trouble which I find a really nice touch. You’ll notice that after a time I start pulling on random stones, to generally no avail, and I also keep looking back at the note as well as the clue the game eventually gives you. I finally pull the right stone and it immediately goes to a cut scene where it shows Nathan pulling the stone out, reaching in the hole in the wall and pulling out a cross/crucifix that looks like it is gold and silver, but also broken a little bit towards the bottom. Nathan notices an inscription on the back which he reads and then after that I get control of him again, it is time to get out of there and head back to the main part of the prison where the guard who brought me there in the first place is waiting with what he hopes is treasure that I’ve found and brought back. I eventually make my way back there, but Nathan lies to the prison guard and says I didn’t find any anything other than where to go to next to hopefully find some. The guard seems disappointed, but also a little suspicious and brings me back to the prison. It is there that I find Nathan’s brother, who is Sam and tell him the news as well as what I actually found. There is also another person that shows up that also seems to know what is going on and what you were originally looking for so the 3 of you end up going to another section of the prison to discuss what was found and what it all means. It is at this point that unexpected guests show up, which turns out to be a lot of them and you know that a fight is coming on. The leader of the group is one you originally fought when you first started the prison section of the game/story. He was none too happy about the smack down earlier and brought in reinforcements. Even though you are outnumbered, Nathan, his brother, and the other guy decide to fight. It is definitely a major fight as you go back and forth with a lot of the unexpected guests. The fight will end when the guards show up including the one who brought you to old section earlier. He takes you, your brother, and the other person to his office and knows that you lied to him about not finding anything supposedly. After he is convinced not to kill you, he wants a bigger cut of whatever treasure that all three of you will hopefully find. After being persuaded to bring down the size of the cut a little bit, it is then that he is killed by one of the three characters. You’ll see it in the video if you decide to watch it. Alarms sound and it is time to get out of there! You, Sam, and the other character quickly make it out of the guard’s office and make a run for it as other guards start coming after you. After many jumps, some fights, and avoiding bullets, it seems you all are going to make it out of there until Nathan’s brother gets shot. You see Nathan holding Sam and trying to pull him up, but blood is starting to come out of his mouth and Sam mentions to Nathan to let him go, with the other guy pleading with Nathan to let Sam go so they can get out of there. Nathan finally lets Sam go and it appears that he’s most likely fallen to this death. Now if you’ve seen the commercials and trailers, you probably already know that much to the surprise of Nathan years later, his thought to be dead brother suddenly shows up. Once you follow the other character off a cliff into the water and a boat, the scene changes to say “15 years later” and shows the current and older Nathan Drake in scuba gear looking for something. This is where I end Part 2 and will begin Part 3 soon. Well there you have it folks! I hope you enjoyed my Uncharted 4 Part 2 gameplay video! I will definitely have more to come as I make my through the game. What are your thoughts on the video? Does it seem like something that makes you want to get the game? How do you feel about this possibly being Nathan’s final go around in the Uncharted series? Post your comments! 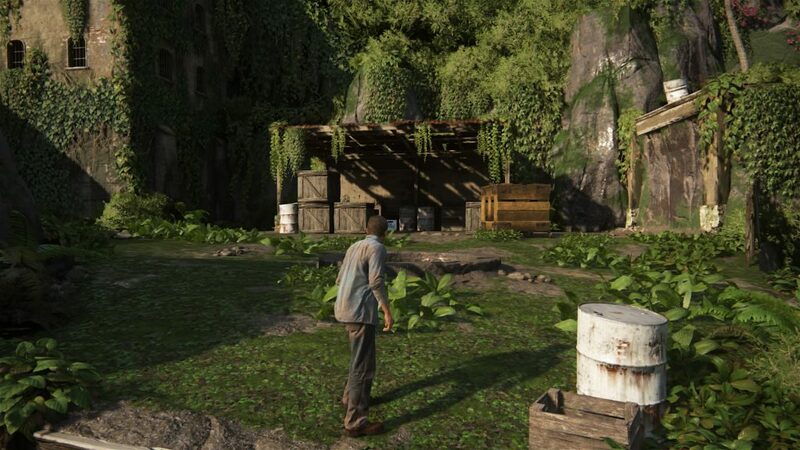 What is Uncharted 4 about? I have given this a lot of tought and finally decidet to buy Uncharted 4. Usualy, I like to play open world games and discover on my own every minute detail, every part of the open world the game offeres me. It is my fault for watching your playthrough. Do you know maybe when Half-Life 3 is coming out? I have waited for ages for this game. Hi there Nikola! I don’t think you’ll be disappointed with Uncharted 4 as it has gotten very good reviews and already has sold quite a bit. I’m not sure of the next Half-Life game as I never got into that series, but it is something I will definitely look into and keep you updated if there is any new information concerning. Are there other games similar to this that you have knowledge on and would be willing to share? Or links how to find such things? I’m glad you liked my post! I will definitely be posting more of this game in the future so definitely check back. As far as other games similar to Uncharted, I would say your next best bet would be the Tomb Raider series. The latest one was released exclusively to the Xbox One, but it was a timed exclusive and should be coming to the PS4 soon.